Why: Sulfur is known as the beauty nutrient and it is also great for it’s detoxing properties, anti inflammatory properties, and joint health. We recently saw an incredible before an after picture of someone who was able to get rid of severe acne by taking our sulfur. This is a bitter and like most things that are bitter it is GREAT for your health! How: We take Genesis Pure Organic Sulfur first thing in the morning. It sits beside our toothbrushes and we down a heaping tablespoon in a warm glass of water. This is not about the taste but the more we take it the more used to it we become and the results are totally worth it. Extra Points: Sulfur used to be found in our veggies but was stripped from most things because of farming with chemicals. Some people say that we are completely deficient in Sulfur. Sulfur has been know to help with arthritis, allergies, add, adhd, joint pain and detoxification. If you get a little headache on your first day or two that is your body detoxing. We love our super fruit shots in the morning! Every morning we line up these beauties and shoot them down. 100% super fruits that are packed with an incredible amount of nutrients. They keep the flu away, keep our plumbing humming, and give us great energy. You can also get these beauties mixed up in what is called GP Fusion. GP Fusion contains over 600 nutrients that boost the immune system just like the four super fruits above do. Why: It is a feel good drink that manages stress levels and hormone swings. One person refers to it as “marriage counselor in a bottle”. This yummy drink is full of super fruits and herbs. It promotes alkalinity and is full of antioxidants and contains 8 servings of fruits and vegetables per 2oz serving. How: We put it in our kids’ lunches and give them a Go Yin on the Go for sporting events. Not only do we think that this is delicious, our kids LOVE it even will fight for the last pack! Needless to say our families our GO YIN devotees, splurging with a swig in the am and in the pm. 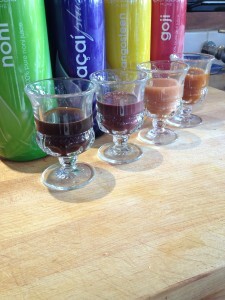 This is a feel good, healthy drink that keeps our families happy AND healthy! Why: Mila Chia is a best in class product that we swear by. It’s micro sliced more maximum absorption and it is a proprietary blend of chia seeds is superior to what is available in the market place. Chia is known for it’s high content of Omega 3’s which help with inflammation. It is helped Mary’s son’s ADHD tremendously and helps us have energy, mental clarity and better elimination. How: We have eaten Mila every day since we found out about it a few years ago. We stir Mila in a big glass of water and let it hydrate for a few minutes. It will thicken a bit. You can add it to your smoothie, oatmeal, or yogurt. Bonus Points: You can get creative with Mila and we love that about it. Try mixing it into your pancakes, quick breads, juices, or even into your meatballs! Why: Genesis Pure Greens has major nutritional content. Our powdered greens is full of anti oxidants, super fruits, super foods, botanicals and immune boosting mushrooms. It is the most complex and complete green powder that we have found and everything from cilantro to kelp to thallus and alfalfa. How: We often stir this into our Mila and it can also be stirred into water or whirled into smoothies. Knowing how great greens are for your body we often double our scoop and take it in the morning and in the afternoon. Bonus Points: Do you make fruit smoothies for your green resistant children? Take a small scoop of greens and throw it into the blender. They will get their greens and not even know it! Why: Energy! This little scoop gives us a healthy dose sustained energy. It helps us to stay super focused and is one of those high impact products. Think red bull with out the stuff that destroys your braincells and with no crash and burn side effects. Also this is good for you and is chocked full of vitamins, minerals, amino acids and glycol-nutrients. How: We like our in a tall glass of water, complete with the Alkalinity Water Concentrate. Why: Daily build is your go to liquid vitamin. Easy to absorb and a comprehensive mulit vitamin that you actually feel in a few minutes. This baby is chock full of b vitamins and we feel energized after each shot. How: You can do a shot or take a Daily Build on the Go packet. Either way we like to take it after we eat some food. Why: To hydrate of course. GP Hydration is like a healthy version of Gatorade with electorlites but with out the harsh dyes or corn syrup. How: We both have athletic kids and love to get out on the courts or hike up the mountain. We will throw a pack of hydration in our drinks before we go and never feel like we are lacking or lagging behind. Why: The Genesis Pure Liquid Cleanse detoxes and cleanses our 7 systems of elimination. We love the light and bright feeling of really cleaning out the pipes and knowing that like a car that needs an oil change we are taking our bodies to the shop for a clean out. How: Every other month we will take the liquid cleanse for 10-14 days. Put it in water and shoot it down. It has smoky tea taste, not super delicious nor is it horrible.